Summer Squash has been referred to by gardeners as pretty easy to grow and a basic must have for any food garden. Like any plant, summer squash does have some needs and ways to grow that are more specific to it. To generally sum up its requirements; summer squash needs fertile soil, steady watering, and lots of sun and warmth. Here’s a list of some steps/tips to help you along your squash way. The biggest and most important piece of gardening is to always do your research before you purchase seeds for an unfamiliar plant type and find a space for your planting. Squash plants can be vine type or bush type, and what type of plant it is will heavily impact the distance between seeds. Since there are multiple varieties of summer squash their seed type and names would probably be a whole article of its own. That part of this will require some personal research on your part. But these basic tips will get you started. Before you prepare your soil, make sure the area for planting has plenty of sunlight throughout the day; better known as full sun. Soil for your squash should be warm, loose, and rich in nutrients. Organic matter (such as compost or manure) is highly beneficial to help your plants along throughout the season. If you aren’t going to do any extra preparation for your soil the best way to go would just be well-drained soil with full sun. Squash can also be planted in 5 gallon or larger buckets and grow well. You can plant summer squash anywhere from spring time-after all frost danger has passed-to midsummer. However, the best time is early to midsummer planting. This helps avoid early squash bugs and plant damage from disease and pests. Ultimately if you are just beginning in planting summer squash, try to aim for early to mid-summer. It will help avoid damage you can’t control. The distance between your seeds depends on the type of plant it is. Vine plants need lots of room to spread and grow, but you can plant bush plants closer together. Most summer squash such as Straightneck Squash the one pictured is a bush type of plant and can be planted about 18 to 30 inches apart or even 2 feet apart. Your seeds should be planted about 1 inch into the soil and watered very well. If you didn’t pre-fertilize the soil or make sure to provide fertilizer in the plant soil as they grow to help ensure the plants have lots of nutrients. If the soil was already fertilized then you can wait until the plants start to blossom. Water is very important to these plants. Water once a week, and make sure the water is reaching at least 1 inch deep into the soil. Moisture of the soil should be determined by the deeper moisture, around 3-4 inches deep is an ideal place to determine whether the plants need water or not. If the soil is dry 3-4 inches deep, water them. 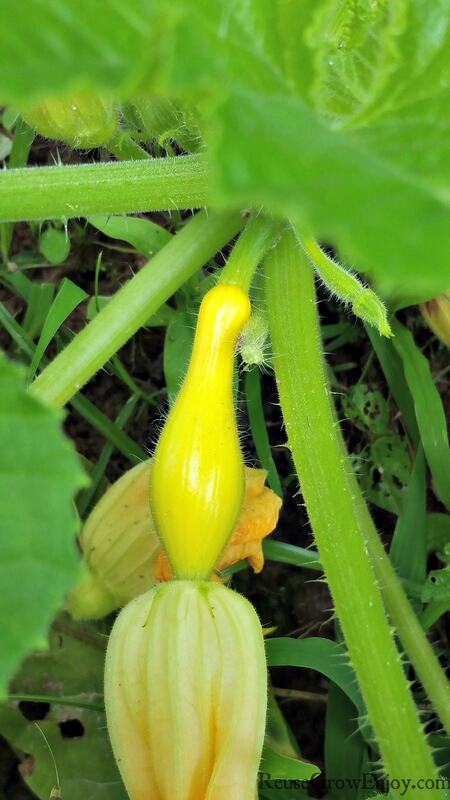 Be sure to keep weeds and other plants from choking out the squash plants. One tool that I find works the best for this without breaking the back is the hula hoe (aka action hoe). Love that tool for my garden! Hopefully, this article can help you along your squash growing path. If you are looking for more gardening tips, here are some others to check out. 7 Easy Tips On How To Grow Corn – Did You Know About #4? ?